Year-end forecasts remain mixed as large jewelry operations, including Blue Nile, reported tepid sales numbers as the holiday season began. Economic indicators, however, continue to point to a strengthening U.S. economy, and store/cyber traffic has been encouraging during the early weeks of the season. The latest quarterly financials from Signet (Kay, Zale, Jared) and Blue Nile show sales declines of 2% and 4.3%, respectively, while Tiffany & Co. eked out a 1% sales increase after posting declines in the two earlier quarters. Hearts on Fire, the diamond brand owned by Hong Kong retailer Chow Tai Fook, saw a 9% decline worldwide in the fall quarter. And Chow Tai Fook’s Hong Kong and China sales fell 23.5% in the last quarter. Balanced against this, however, are optimistic reports from higher-end independents. A Centurion Magazine survey reported that 60% of luxury jewelers reported sales gains through Black Friday and Cyber Monday, with 28% reporting increases over 10%. Some 25% reported sales declines of 5% or less. In addition, a survey by the “The Street,” a stock market news site, found a 7.1% uptick in combined store and online holiday sales. Beyond the holiday season, a report from ABN Amro, the leading diamond industry lender, sees the U.S. economy improving (and a slight upturn in China) through next year, bringing with it an increase in diamond demand that will reverse the slow but steady erosion of polished prices that has occurred over the past 18 months. A Bain & Company report cautioned, however, that diamond producers have been selling more rough than demand can absorb, leading to a potential supply glut next year. After a slow start, and several important diamonds and gemstones not selling, the fall auction season was successful with a number of multi-million-dollar fancy color diamonds changing hands. At Christie’s Nov. 29 Hong Kong sale, a GIA-graded 4.29 ct Fancy Vivid blue diamond sold for $11.8 million ($2.7 million per carat), while the 10.7 ct “Ratnaraj” ruby sold for $10.2 million. 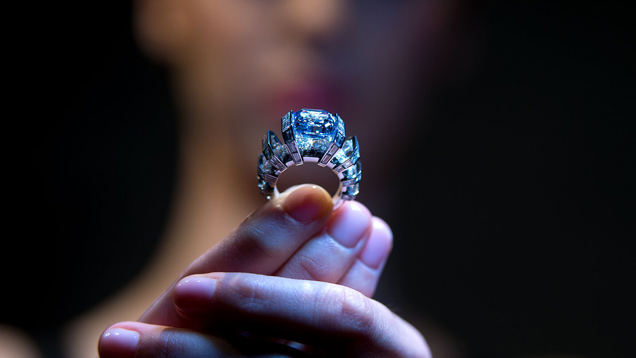 At Sotheby’s Geneva sale, which totaled more than $136 million, the 8.01 ct “Sky Blue” diamond, graded Fancy Vivid blue by GIA, drew a winning price of just over $17 million ($2.1 million per carat). A 7.74 ct Fancy Deep blue diamond also went for $3.7 million ($1.7 million per carat). 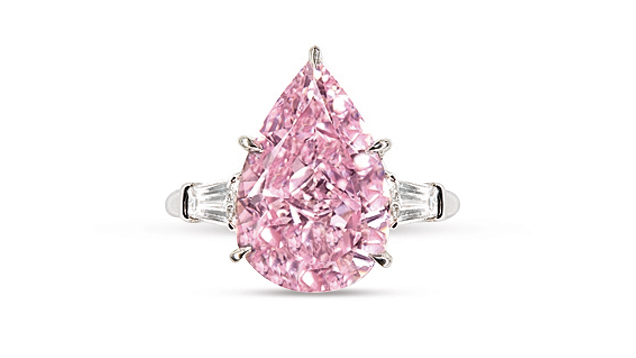 Christie's Nov. 15 Geneva auction saw 35 lots exceed $1 million, including a 9.14 ct Fancy Vivid pink pear shape that sold for $18.2 million ($2 million per carat), and a GIA-graded pair of pear shaped D Flawless diamonds weighing 52.55 carats and 50.47 carats that sold for $17.6 million. The abrupt action by Indian Prime Minister Narendra Modi to ban cash transactions with 500 and 1000 rupee notes ($7.35 and $14.70) by Dec. 30 has caused chaos in the country’s retail and wholesale markets because these notes comprise 86% of the cash in circulation by value. The move forced cancellation of several end-of-year gem and jewelry trade fairs. The largest affected show is the Dec. 23-26 Jaipur Jewellery Show, which was postponed to an unstated date next year. Gemfields, the colored stone miner, also cancelled its Jaipur auction of emerald and beryl, which was scheduled for the same time. Those holding these bills have to deposit them in their bank accounts by Dec. 30 with strict limits on bank withdrawals. The government’s Ministry of Finance also tightened reporting requirements for cash transactions over $3,000. The ministry said the prime minister took the action to crack down on “unaccounted wealth and to curb financing of terrorism and other subversive activity.” While the ban will have little effect on India’s export-oriented diamond trade, retail sales in the country remain largely a cash business and economists predict the action could reduce growth by as much as 1%. Russell Shor is senior industry analyst at GIA in Carlsbad. The U.S. holiday shopping season is looking positive, despite signs that an economic slowdown may be coming in 2019. Plus, more auction sales records. London jeweler Laurence Graff unveiled the first diamonds polished from the 1109 ct Lesedi La Rona, which is expected to yield some 60 stones ranging from under one carat to over 100 cts, according to the company. The building blocks are in place for a strong 2018 U.S. holiday season. Plus, diamond market updates and upcoming auctions. Business at the September Hong Kong Gem and Jewellery Shows was spotty, despite a strong world economy. Buyers left early to avoid Typhoon Mangkhut. Retail sales of diamond jewelry worldwide totaled an estimated US $77.5 billion in 2017, up from $74.6 billion in 2016, according to a survey by Tacy/Pharos Beam Consulting. Demand for diamonds has been good so far this year. Rough sales have increased and large diamonds are being mined. Plus: Online sales tax changes.